Liverpool wins the Champions League final on penalties against AC Milan after the most dramatic (and, dare I say, incredible) comback in the history of this competition. By the end of the first half, Liverpool was trailing Milan AC by 3-0 !!! Goals from Maldini (1′) and Crespo (39′, 44′) had already spoilt the party. Actually, the group of people I had invited home to watch the match left at that time. Everyone (except me, of course) thought that Milan AC had already won the match. I had a gut feeling that something special was going to happen. I was in no way stressed. At the beginning of the second half, Hamann was substituted for Finnan who was injured. Liverpool switched to a 3 men defense (with Traore, Hyypia and Carragher). Hamann and Xabi Alonso controlled the midfield while Gerrard was allowed to roam behind the attackers. And the match completely changed ! The match went down to penalties after a fruitless extra-time with Steven Gerrard playing as a (perfectly adequate) right fullback to help the defense. 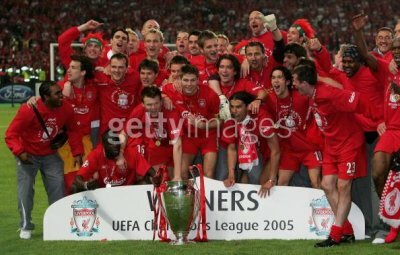 And owing to Dudek’s magic (a la Grobbellar) during the penalties, Liverpool won its 5th Champions League Cup ! The Cup is now our’s to keep. the best team in the world!!!! and of course as five time winners they get to keep the cup.-well deserved. Dudecks double save!!!! YEEEEEES LIIIVERPOOOOOL!!!!!!!!!! I have waited years for this!! i was extatic! can not believe it, 3 nil down and then we win. It has to be beginning of a new era……the cup is back where it should be, and it isnt going anywhere!!!! 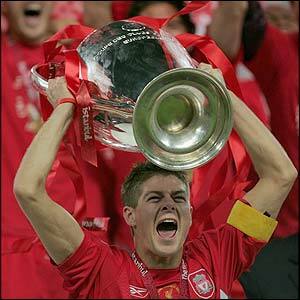 You’ll never walk alone!!!!!!! !…..btw i read something about mauritian athletes on here, was the writer from mauritius??? To vino: If you mean the page on Maurtian Athletes at Athens 2004, then yes, that page was also written by me (like most other pages by the way :-)) live during the event. liverpool c’est trop bien ? nice to meet U ……….